Want to sell your junk car for cash in Michigan? The Clunker Junker can help. We are Michigan's top junk car and truck buyer. The state of Michigan has everything from pristine natural landscapes like the Huron-Manistee National Forests to thriving urban cities such as Detroit. Weather can be everything from absolutely perfect, to so cold you feel like you’re on another planet. These extremes can wreak havoc on your car, and it can only hit so many pot holes before it gives up on life. Luckily, The Clunker Junker pays cash for cars in Michigan regardless of what condition they are in. We’ll even send out a tow truck to your location to pickup the vehicle up, and that service is included in all of our offers! Michigan is and always has been the heart of the American automotive industry. The “big three” auto makers, Ford, Chevrolet, and Chrysler, all call Michigan home. Generations of Michiganders have built their family legacies with hard work building solid, American cars and trucks. So it’s no surprise that Michigan residents have a strong affinity for their automobiles. When they are ready to sell a junk car, they turn to The Clunker Junker. We buy cars in Michigan, and pay top dollar for them. We are car people too, and we know that in many cases cars become more than just a machine. They become a part of our family. If you need cash for junk cars in Michigan, only deal with the best: The Clunker Junker! They want top dollar for junk cars. They want the fastest pickups. Ours are usually between 1 to 3 days. They want friendly and professional service. Our customer service is second to none in the industry. Selling your car in MI used to require posting flyers, taking out space in the newspaper or placing ads online. But now all you have to do is contact us or visit our website. We buy junk cars in Michigan and we'll need a few details about your vehicle, we can give you a fair, and instant, cash offer. Michigan junk car removal starts with the important information on your car. We need to know the year, make, model and current condition of your vehicle. With this information you can get an instant offer. You don’t want your old beater Chevy, or a dead Ford sitting in the driveway forever. Sell your junk car in Michigan and get top dollar when you accept our instant cash offer. Once you do, our awesome junk car removal team will reach out to schedule pickup. After accepting an instant offer from The Clunker Junker, we’ll schedule to pick up your vehicle. Our background checked and professional Michigan junk car buyer will arrive to take the car and pay you cash on the spot. There aren’t any towing fees, and our drivers usually pick up cars within about 3 days or less. How much will I get if I sell my junk car in Michigan? We work to connect out-of-commission vehicles with auto salvage yards and Michigan junk car buyers. Because we network with these resources, we can get you top dollar for your old car. Age and condition have the most impact in deciding how much your car is worth. This category for junk cars include the vehicles that are rotted, unable to run, and don’t have any usable parts. These cars are still worth something even if they’re only used for scrap metal. We can often pay between $150 and $300 for these vehicles. Many people find themselves with a car that will cost them more in repairs than the car is worth. Junk yards purchase these cars for their parts or salvage for scrap. Nearly 75% of these cars are reusable or have recyclable pieces. We pay top dollar for junk cars even if they don’t run and have body damage. Cash for junk cars in Michigan isn’t limited to cars that are no longer drivable. You might have forgotten about that Toyota Camry in your garage that needs work. But, that doesn’t mean that its useless. The right buyer may be able to put your car back on the road or use it for other repairs. We have put together a simple guide and example for how to sign your Michigan title when you are selling your vehicle. If there are multiple owners listed on the title, they must all sign the title unless the names are separated with "OR". Make sure you use the front of your Michigan title when signing. You need to use the section called "Title assignment by seller". Don't write anything in the Michigan dealer sections on the back! First sign the front of the title where indicated by "Signature of Seller(s)". 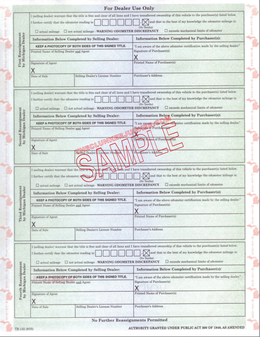 Print (don't sign) your name on the front of the title where it reads "Printed Name of Seller(s)". 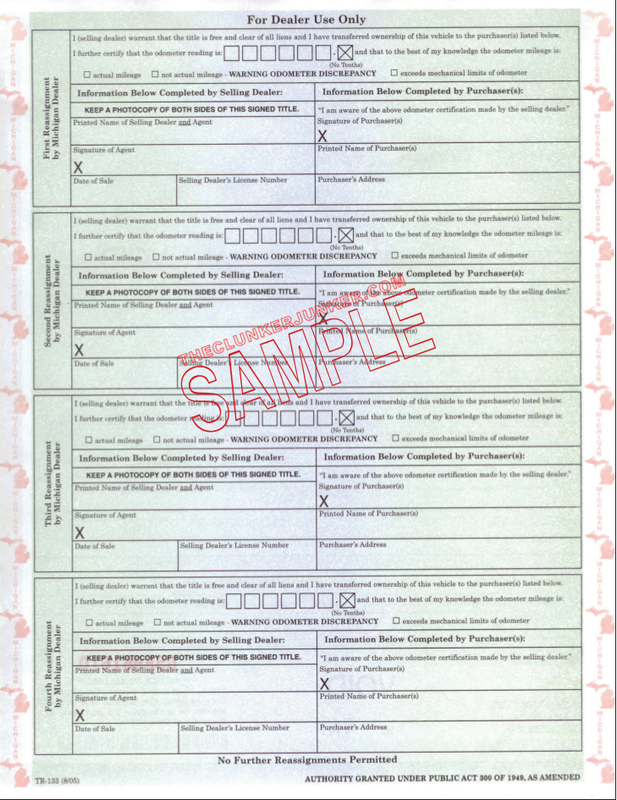 Complete the Michigan ExpressSOS duplicate title application. Or, fill out the Michigan Application for Vehicle Title form. Bring your complete application to your local Secretary of State branch. Please note that there is a 7 to 10 day waiting period before a duplicate title can be issued and the cost is $15.00. You can request expedited service for an additional $5.00. Getting rid of an abandoned vehicle in Michigan can be a difficult process. Unfortunately, you cannot just sell any junk car that ends up on your property if you do not own it. You'll need to follow the Michigan abandoned vehicle removal procedures. We have given a general overview of what that entails below. To have an abandoned vehicle removed from your private property, you must first contact your local law enforcement agency. 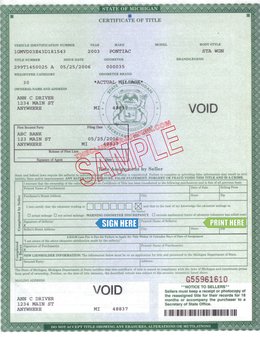 Once the vehicle has been removed, the registered owner and/or lienholder have (20) twenty days to show interest in the vehicle after sending a notice via certified mail. If no owner/lienholder show interest in the vehicle, it will be sold at public auction. I don’t have my title, can you still buy my car in Michigan? Yes! In some cases we can purchase vehicles with no title in some cases. However, our no title offers are often significantly lower than offers with title. You’ll also be asked to prove that you own the vehicle. 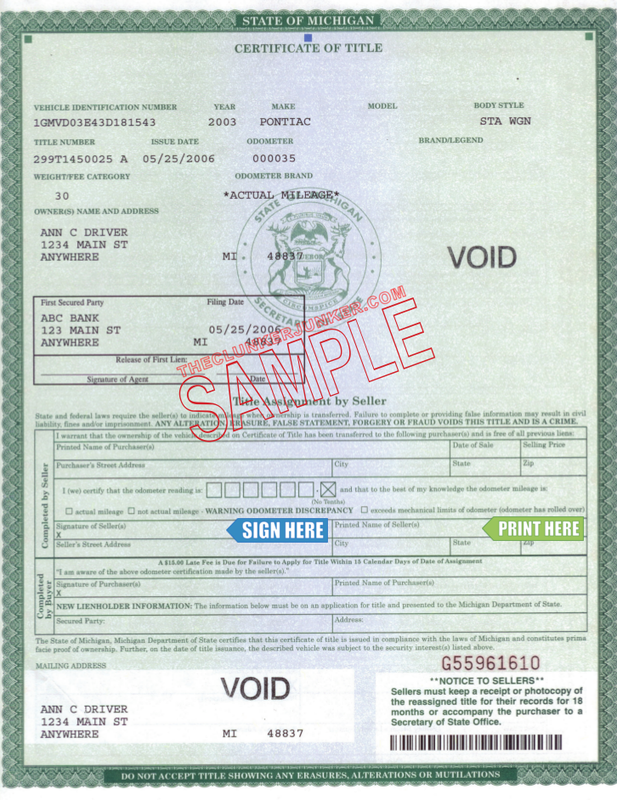 The buyer may ask for a photo ID that matches a current, non-expired registration. We do not guarantee purchase of any vehicle without a title. Michigan often changes their title documents from year to year. If you have questions about your specific title, please contact your Michigan SoS. Yes, unless you are transferring the plates to a new vehicle. You can return the plates to your local SoS office. You may need to notify your local SoS that you have sold the vehicle. You can contact them with any additional questions or concerns about the transfer of your title. The Clunker Junker vehicle removal service works fast. We pick up your car as soon as possible, and always pay cash when you accept our offers. Visit our website today to see what you could get for having your junk car towed away. "The car's right front headlight is busted out, and the hood is a little bent on that side. The car does run and drive, but it dropped a rod and is only running on three cylinders. " "The power steering pump is bad, and little things like the driver-side door doesn't open from the inside nor does the power window work for the driver side. Basically, I want to junk it to put the cash towards another vehicle instead of dumping more cash into it." "The car was in a front-end collision, the radiator leaks, and it has not been started in nine months. There's possible frame damage to the front, and the front doors do not open all the way. " "I do not have the key, but I am searching for it. The passenger rear window is broken out, and the front bumper is off. The driver-side door panel is off but here, as the window is off of the track. It has relatively new tires and rims. " "The vehicle was running as of the 1st of March. The alternator is bad, the clutch has a slow leak, and the right front tire is flat. The interior has normal wear and tear except for the driver seat which has a rip in the side. The tags expired at the end of January. " "The body has no large dents or rust, but it does have scrapes that could be fixed. One headlamp is broken. The leather interior is clean and in good condition, and there are no rips. The vehicle has four new 50,000-mile, all-weather tires that were purchased 17,000 miles ago." The Clunker Junker is one of the top junk car buyers in the state of Michigan. To date we have made instant offers on over 30 thousand vehicles across the state, totaling over $7 Million offered! Of those vehicles, approximately 4% were purchased without a title. We also buy cars on a wide spectrum of conditions and 55% of the vehicles we've made offers on in Michigan do not start or drive. Many also have moderate to severe body damage. Grand Rapids in LaSalle County was our top producer, followed by Kalamazoo.